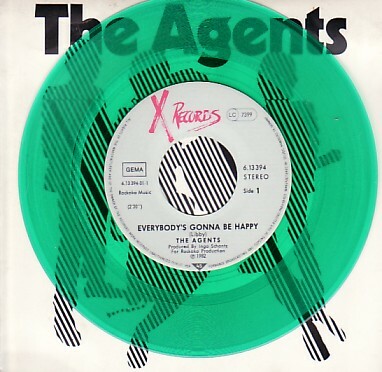 Agents ‘Everybody’s Gonna Be Happy’ 7″ > Blah! Blah! Blah! Agents Everybody's Gonna Be Happy 7"
First time I've had this record, The Agents Everybody's Gonna Be Happy, it's a power pop song by a UK band that was released in Germany only in 1982 on green vinyl and in a lovely pop up sleeve. They went on to release an album but never released anything in the UK. I can't think of any other bands that did this, it's truly bizarre! The Wikipedia piece about the band is interesting and explains the whole saga. You can read it here.